$8 General admission. $1 off with a canned good, $1 off if in costume, kids 9yo and under FREE with paying adult. $1 off with a canned good, $1 off if in costume, kids 9yo and under FREE with paying adult. Cash at the door only. Ocean City's only pop culture event returns this December 8th. After the huge turn out of last year's event, the convention is moving into the Roland E. Powell Convention Center affording much more space for attendees to enjoy the con. The convention features an exciting selection of guests and events sure to be a big hit with attendees. Special guests from the worlds of comics, TV, and more will be on hand. Such guests as Adult Swim voice actor Carey Means (Frylock on Aquateen Hunger Force, Jonah Bishop on Welcome to the Wayne), Superstar DC comics artist Greg LaRocque (The Flash, Web of Spider-Man, Stargate Atlantis, and many more) will be available to meet attendees and sign autographs. More guests will be announced as the event draws closer. Along with meeting guests, attendees will have access to anime screenings throughout the day, informative and entertaining panels, a costume contest with prizes, vendors of geeky goods and independent content creators. Cosplay has become a huge part of the convention experience, and the con will be a hub for costuming fun. A cosplay contest with prizes will be held, and those who show up in costume will receive one dollar off admission. Professional cosplayers, Katie Coe Cosplay, Kevin D Cosplay, Carter Cosplay, as well as the 501st Legion (Star Wars costuming club), and others will be in attendance to take pictures with attendees and discus the art of costuming. Ocean City Comic Con strives to not only bring geek culture to the shore, but also to serve our community. Attendees who bring a non-perishable food item for Diakonia Inc. will receive one dollar off the admission price. Additionally, a portion of admission will be donated directly to the Hero Initiate, and to the Samaritan Shelter. 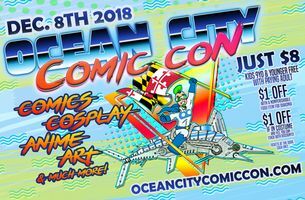 This one-day event promises to bring together locals and those coming from out of the area alike to celebrate pop culture right in the heart of Ocean City Maryland. Quick Facts: Where: The Roland E. Powell Convention Center 4001 Coastal Hwy, Ocean City, MD 21842 When: December 8th, 2018 10AM - 5PM Admission: $8 Kids 9yo and younger free with paying adult, $1 off if in Costume, $1 off with a non-perishable food item for Diakonia, For more details, directions and the latest news you can find Ocean City Comic Con online at: http://www.oceancitycomiccon.com and on Facebook, Instagram, and Twitter.